“Be calm but be prepared,” the Seattle-based Mexican consul tells a nervous population wondering what Donald Trump’s election means for them. He is traveling the state as part of an 11-point plan released by Mexico’s foreign ministry. Mexican Consul Roberto Dondisch has had a busy few weeks. Based in Seattle, he’s been talking with officials and Mexican nationals around the state, planning trips to see more and putting together a local plan to help a population deeply rattled by the election of Donald Trump. Now is the time to get documents in order should their immigration status be questioned. 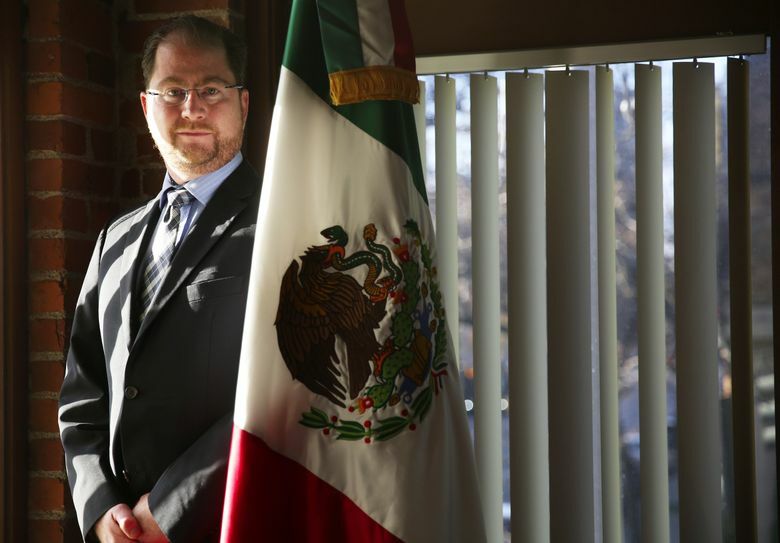 “People are concerned, because they want to know what the elections mean for them,” said the consul, 41, who came to Seattle four months ago after serving as head of global issues for Mexico’s Ministry of Foreign Affairs. Speaking at the Belltown consulate, he marveled that it doesn’t matter what someone’s immigration status is. Even green-card holders are nervous in the face of an administration headed by Trump, who during the campaign portrayed undocumented Mexican immigrants as criminals and called for mass deportation. Dondisch was just back from the Tri-Cities, and planned a trip to Yakima in the coming weeks as part of an intensified effort to bring what he called a “consulate on wheels” to different parts of the state. The trips, to take place every two weeks, are in keeping with an 11-point plan released after the election by Mexico’s foreign ministry. Other measures in the plan include a national toll-free hotline — 1-877-632-6678 — for dispensing legal help and other urgent assistance. Counselors will even come on the line to offer emotional support, Dondisch said. Nearly 800,000 people of Mexican heritage live in Washington state, according to the consul’s figures. He said they represent the vast majority of Washington’s Latinos, now the largest ethnic group other than whites in the state, making up roughly 12 percent of the population. As he steps up his outreach, Dondisch emphasizes that any policy changes in the new administration are not likely to happen overnight. At the same time, he urges people to get their documents together — both American ones, such as tax and school records, and Mexican documents such as passports for American-born children. While hesitant to spell out the reasons, he allowed that such documents may become necessary if people are threatened with deportation. Children who are American citizens may not have Mexican passports but would need them if they travel with deported parents. The consulate will open more frequently on Saturdays, twice a month, to cope with possible increased demand. Unlike American passports, which normally take weeks to process, Mexican passports are issued on the spot. A U.S. State Department official was visiting the consulate last week to learn how it was done and to offer help with American documentation. Dondisch also warned of scammers exploiting fears of an immigration crackdown and offering ostensible easy fixes. Given the large Mexican population in this state and country, and current politicization of the same, he faces issues most consuls don’t. Does he encourage his compatriots to stay in this country? He said he does not. People need to make their own decisions about whether to leave or stay. “I’m making sure they know their rights and are treated with dignity,” he said. He added that he worries about families torn apart by deportation and about so-called “Dreamers,” brought here as children and given the temporary right to live and work here by President Obama under a program that Trump has said he would end. Yet, he also said he tells Mexicans they’re always welcome to come home — “Please come back.” The Mexican government is expanding efforts to resettle repatriated nationals, who were growing in number even before Trump’s victory. On his trips around the state, Dondisch said he wants to meet with local officials as well as Mexican immigrants. In Pasco, still reeling from the 2015 fatal police shooting of a Mexican farmworker, the consul said he was pleased to hear from the police chief that local officers will not concern themselves with immigration status. Whether Trump would be pleased is another matter. The president-elect has threatened to withhold funding from “sanctuary cities,” a loose term given to municipalities, including Seattle, that do not use local resources to enforce federal immigration law. The consul steered away from criticizing Trump. “For now, it is about having an open mind,” he said. Dondisch is clearly ready, though, to talk about hot-button issues that arose during the campaign. Take the president-elect’s disdain for free-trade agreements like NAFTA, signed in 1994 by the U.S., Canada and Mexico. “We’re open to modernizing NAFTA,” Dondisch said. But he also stressed that trade between Washington state and Mexico has since grown enormously. Mexico is the second-largest export market for Washington apples, a major buyer of Boeing planes and home to an Amazon fulfillment center as well as roughly 500 Starbucks and 40 Costco stores. How that might be affected under a Trump administration is up in the air. Dondisch, like everyone else, is waiting to see.